Rug pads under rugs will minimize slippage, increase the life of the rug, create a cushion between your shoe and a hard floor surface, and absorb noise. Rugs that are very thick and heavy may not need a rug pad if the rug stays put. Otherwise, most quality rugs should have a good quality rug pad underneath them. You get what you pay for in rug pad selection. 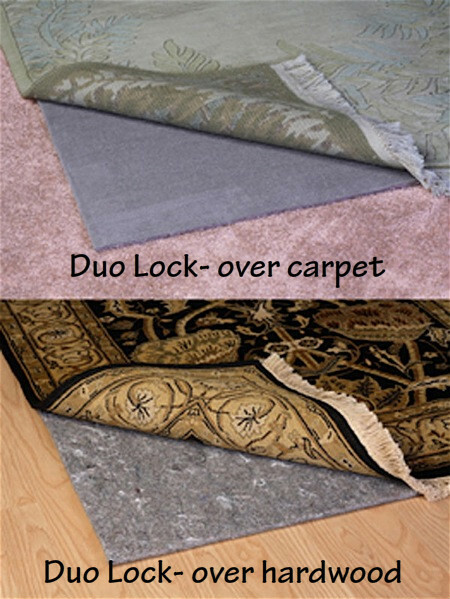 Discount or cheap rug pads do not work as well as higher end pads either functionally or for duration. Rubber rug pads either crumble around the edges, or become gummy and stick to the floor or backside of the rug. Many of the synthetic urethane foam pads are too soft and lightweight to provide much support. We highly recommend Duo Lock Pads. This pad provides the ultimate in cushioning and insulation for fine rugs. Guaranteed to maintain its “no-slip” properties with proper maintenance. It is designed for use under rugs of any kind and helps prevent premature wear of rug. It features a needle-punched fabric with textured waffle-backing for improved gripping power on both hard surfaces & carpets. Contact us for pricing. We custom cut every pad to correctly fit the rug.